Anton-Wilhelm Amo was a respected Ghanaian German philosopher who taught at the Universities of Halle and Jena in Germany in the 1730s… That’s right… you read it well, 1730! This man is said to be the first African to be awarded a doctorate degree from a European university, and to later teach there. Who was Anton-Wilhelm Amo? 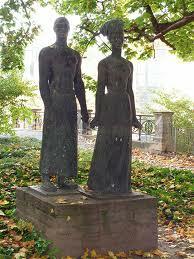 Anton-Wilhelm Amo was born in 1703 in Awukena near the town of Axim in Ghana. At the young age of 4, he was taken to Amsterdam; some accounts say that he was taken into slavery, others that he was sent to Amsterdam by a missionary based in Ghana. Either way, he was given as a present to the Duke of Brunswick-Wolfenbüttel. Amo was raised as a member of the family, and attended the Wolfenbüttel Ritter-Akademie from 1717 to 1721, and then the University of Helmstedt from 1721 to 1727. He also met with the great German mathematician and philosopher Gottfried Leibniz who was a frequent visitor of the Wolfenbüttel palace. He then attended the Law school at the University of Halle in 1727, and finished his preliminary studies in two years at the end of which he wrote a dissertation thesis titled “The Rights of Moors in Europe.” He went on to further study philosophy and earn a doctorate degree in philosophy from the University of Wittenberg in 1734. Amo was a learned man, and a true polyglot as he mastered six languages: French, English, German, Dutch, Latin and Greek. 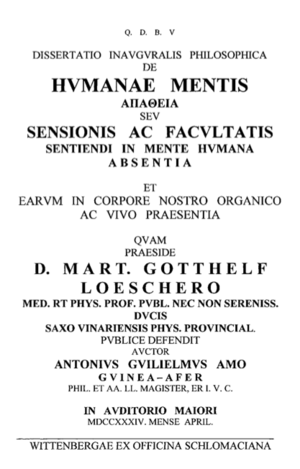 He was appointed professor of philosophy at the University of Halle in 1736, and went by his preferred name Antonius Guilelmus Amo, Afer of Axim. He taught psychology, ‘natural law‘, and the decimal system. He then published his second major work: ‘Treatise on the Art of Philosophing Soberly and Accurately (Tractatus de Arte Sobrie et Accurate Philosophandi). In 1740, he joined the University of Jena in Jena, central Germany. During the early years of the reign of Frederick II of Prussia, Amo was invited to the court in Berlin as a government councilor. Amo was also elected a member of the Dutch Academy of Flushing. There were lots of social changes in Germany in the 1740s, and people were becoming less liberal, xenophobe, racist, and Amo himself was subject to public threats from his ennemies. Eventually, Amo returned to his land of birth, Ghana, and settled back in Axim where he was honored as a traditional doctor and worked as a goldsmith (by some accounts). He was laid to rest in Fort San Sebastian in Shama, Ghana, in 1759. Today, the University of Halle-Wittenberg annually awards the Anton-Wilhelm Amo prize to deserving students. There is also a statue in Halle in his honor. This man was at the time thought to be among the most prominent German thinkers of his times. For more on this great man, please check out Anton Wilhelm Amo by Marilyn Sephocle ( Journal of Black Studies Vol. 23, No. 2, Special Issue: The Image of Africa in German Society (Dec., 1992), pp. 182-187), Anton-Wilhelm Amo from SUNY Buffalo, The Life and Times of Wilhelm Anton Amo by W. Abraham, Transactions of the Historical Society of Ghana 7 (1964) P. 60-81, Anton Wilhelm Rudolph Amo, Anton-Wilhelm Amo, a Ghanaia Philosopher in 18th Century Germany on the blog of Justin E. H. Smith, and lastly Black History Month in Europe 2007: Amo’s Ghost where the blog’s author asks very poignant questions about the life of Amo. Everytime you think of Africa as the dark continent, or think that Africans were illiterate people, or had no ‘light’, think about Anton-Wilhelm Amo the great Ghanaian-German philosopher of the 1700s who taught great minds in Europe, and was among the most prominent German philosphers of his time. Merci pour toutes ses informations, Il y a quelques jours vous nous appreniez que la multinationale VLISCO était déjà établie au Togo en 1846. Aujourd’hui qu’un ghanéen était professeur de philosophie dans des universités en Allemagne en 1734. Mon Dieu comme l’histoire a du être falsifiée pour donner le complexe d’infériorité aux noirs. Vous faites un travail immense de reconstruction et de guérison du Noir. Merci continuez. Thanks. Genius is God-Providence given to to all abled bodied homo-spiens. Human elements demand contenders like Gandhi and Dr. ML Kingg who moved the envelope furhter w)no resistance to tyrany for all to see. A people perish with a lack of knowlegde.